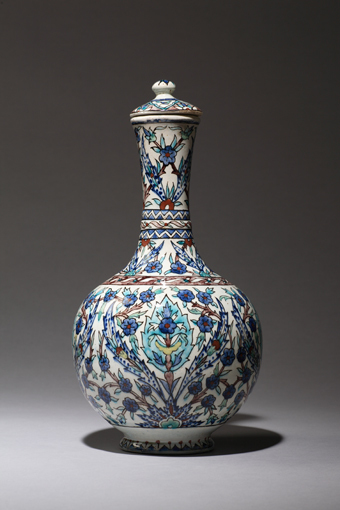 This dossier presentation of 35 works marks the debut of the Ottis collection of Islamic ceramics. An ongoing gift of nearly 300 vessels and tiles fired in kilns from Iran to Morocco and spanning from the 9th to the 19th century, the Ottis ceramics greatly expand the Museum’s holdings of Islamic art, creating new opportunities for exploring cultural exchange between East and West. The donated works were acquired over the past 25 years by the late Larry Ottis and his wife Nancy on their annual trips to West Asia. An early, conservative tradition is represented by oil lamps and sturdy storage jars of the 9th through 15th century, all embellished with turquoise or cobalt blue glaze. Contemporary with these but more innovative in technique are dazzling examples of lustreware and colored glass, along with new adaptations of Chinese splashed glazes and under-glaze slip painting. Tiles for courtly pavilions, lamps and ornaments for Islamic mosques, and colorful plates and vases for the bourgeoisie bring the exhibition into the era of global empires, the 17th through 19th centuries. The Museum is deeply grateful to the Ottises for sharing their love of Islamic art and culture with the public.